Legal news for New York SUV rollover attorneys—New York State police report a Buffalo man was killed in an SUV rollover in Pembroke, NY. Pembroke, NY (NewYorkInjuryNews.com) – A fatal and tragic accident occurred Saturday, January 16, 2010, when an SUV rolled over and claimed the life of a South Buffalo man, according to The Buffalo News. New York State police reported to the scene to find the 1997 Chevrolet Blazer flipped over on the highway in the town of Pembroke. State police reported that the SUV had been traveling in the westbound passing lanes of the Thruway, when the driver happened to swerve into the left shoulder. 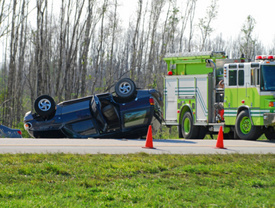 The driver then over-corrected to get back into his lane when the SUV flipped several times and ejected the driver. The vehicle erupted into flames. The severely injured driver was found by responding officials laying in the road away from his vehicle. He was identified as 53-year-old Mark Deacon. A responding Mercy ambulance arrived at the scene to transport the injured man. There were not any passengers reportedly traveling with Deacon. Deacon was rushed to Erie County Medical Center in Buffalo for a potential traumatic brain injury (TBI). He was cared for by medical professionals until his injuries proved fatal the next day.